1 of 1 Heat oven to 450 degrees F. Coat two rimmed baking pans with nonstick cooking spray. 1 of 1 In a blender, process red peppers, almonds, vinegar, olive oil, garlic, salt and pepper until smooth. 1 of 3 Place Brussels sprouts and carrots in one of the prepared baking pans, toss with oil and season with 1/8 teaspoon each of the salt and pepper. Roast at 450 degrees F for 30 minutes or until tender. 2 of 3 Meanwhile, season salmon with the remaining 1/8 teaspoon each salt and pepper. Place in the second prepared baking pan and roast at 450 degrees F for 15 minutes. 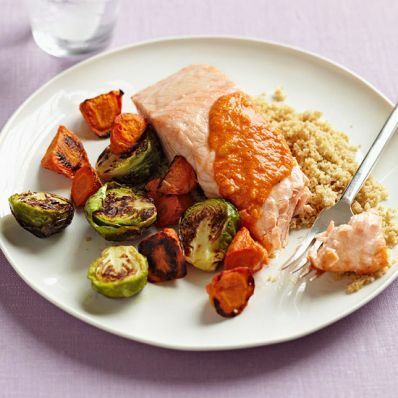 3 of 3 Serve salmon, couscous and vegetables with romesco sauce on side.